The Student Money Management Center and the Sam Houston State University Food Pantry are answering the call of hungry Bearkat stomachs with the inaugural “Feed the Growl” event on Feb. 26. 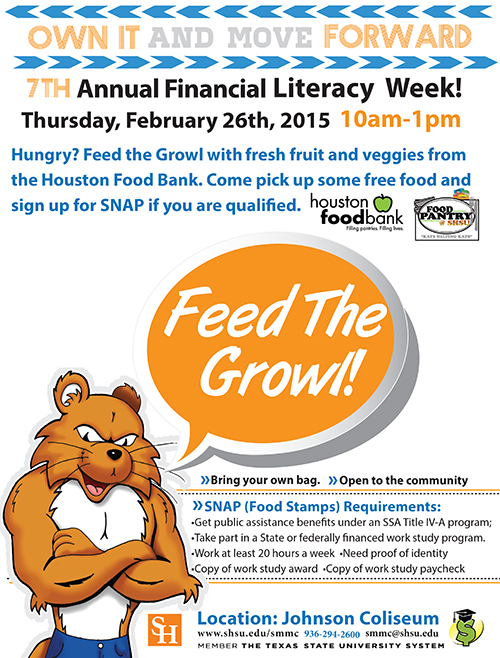 A seventh annual Financial Literacy Week activity, the event will offer approximately 10,000 pounds of fresh produce, courtesy of the Houston Food Bank, to members of both the Bearkat and Huntsville communities in a “farmer’s market”-style set up. Bearkats and Huntsville citizens can drop by the Bernard G. Johnson Coliseum on Feb. 26, from 10 a.m. to 1 p.m., and pick up some free food, as well as learn if you qualify for the SNAP program. The idea for “Feed the Growl” came when Amber Spell, donor relations chair and treasurer for the SHSU Food Pantry, reached out to the Houston Food Bank to inquire about their services and was directed to Kelly Zigler, community events supervisor for the HFB’s social services outreach program. “She informed me of a service they offered where they take a 28-foot-long truck with 10,000 pounds of food out into the community and distribute it all for free,” Spell said. “The idea seemed like a wonderful opportunity for Sam Houston, so I jumped on it. The SMMC got involved when Spell realized that the main reasons for using the Houston Food Bank’s services directly correlated with the purpose of Financial Literacy Week. “In 2014, a survey of SHSU students indicated there was a level of food insecurity on campus. The survey indicated that some of our students at Sam Houston were hungry and worried about not having enough food for their next meal,” said SMMC director Patsy Collins. “As the director of the Student Money Management Center, this was not a surprise to me. The SMMC works with students to create a budget that secures their room and board as well as other expenses incurred while in college; many of our students were struggling,” she said. “Even while working, many students are not able to get enough hours from only one employer to make ends meet. Many students are working multiple jobs to pay for their education as well as the necessities of life. It is hard for students to study effectively if they are hungry or worried about how to pay their rent and food. The decision to extend the service to the entire community was the result of the generous donation by the HFB; there was concern that students may not be able to take home all 10,000 pounds of food, so Zigler suggested opening the event to the community. Students can qualify for the SNAP program if they get public assistance benefits under an SSA Title IV-A program, such as at SHSU; take part in a state or federally financed work study program; and work at least 20 hours per week. Students must provide proof of identity, a copy of their work-study award, and a copy of a work-study paycheck. For more information, contact the Student Money Management Center at 936.294.2600 or smmc@shsu.edu.